Tomahawk is a social media player that multi-source, socially-connected, cross-platform, and open-source. It hooks you up with friends – connect with your jabber/gtalk/twitter friends and share collections and playlists. * Added visual notification for database indexing job. * Fixed icons not appearing in resolvers list. * Fixed various UI glitches and stray error messages in stations. * Fixed bug where album page would resolve bottom-to-top. * Fixed bug where Footnotes would not update when changing selected album in Album View. * Fixed dragging albums and artists from charts, album, and artist views. * Fixed bug where filter text would be one step behind filter value. * Fixed bug where resolvers would enable themselves after auto-updating. * Fixed occasional crash when dropping tracks onto New Station item. * Added jump-to-current-track support for search results page. * Fixed out of sync Show/Hide menu items on OS X when hidden with cmd-h.
* Fixed non-resolving tracks when dragging from album view. * Fixed /Volumes directory not showing up on OS X. * Fixed fetching album covers for albums with special characters. * Show errors and continue gracefully when resolved audio is not available. * Fixed various crashes on exit. * Added basic command-line options for playback control. * Bumped up web api timeouts to allow web clients to finish resolving. * Added filename suggestion when exporting a playlist. * Cleaned up highlighting of artist names in album view. * Cleaned up alignment of playlist items. * Fixed potential crash when searching. * Added support for disc number. * Added ability to “lock on” to a user when listening along, to skip along. * Fixed bug where loved tracks would be refreshed much too often. * Fixed startup crash on OS X. * Fixed some font size issues. * Sped up Tomahawk startup by moving chart loading into a separate thread. * Added support for parsing Grooveshark and Tinysong tracks and playlists. * Reorganized sidebar to follow more logical item groupings. * Added artist and album results to global searches. * Fixed style and contrast issues when using GTK styles. * Fixed paths to artwork when using MPRIS2 interface. 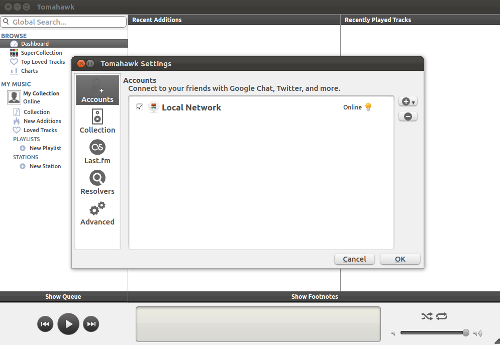 1 user responded in " Install Tomahawk social media player in Ubuntu using PPA "
If you can get LinkedIn support, then I would seriously consider to use this.